This house is wonderful. 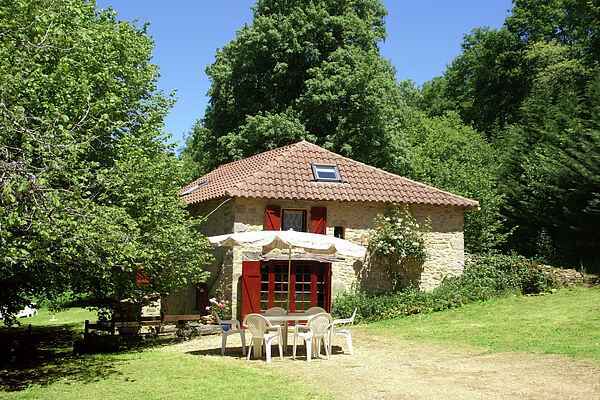 This former water mill, dating from about 1600, is now a lovely holiday home near Villefranche-du-Périgord (5km). The small former water course is now a rivulet that still flows under the house and emerges to the side. The children will have lots of fun on the vast lawn where they can play badminton and volley ball. Indoors, enjoy a nice open fire and relax in the living room. There are also six mountain bikes available. Do not hesitate to use the bikes. The area is wonderful. Villefranche-du-Périgord is a beautiful small 13th century fortified town. In the old covered market there is still a lively mushroom and chestnut trade, very fashionable among the French. The French travel long distances to visit Villefranche. The local forests are full of this wonderful produce. You can swim in one of the lakes near Villefranche, such as in Prats-du-Périgord (7km) and in Cazals (12km). Visit the most beautiful places in the region by car. We recommend a visit to the well-preserved town of Monpazier (25km) and the beautiful town of Cahors (46km). Note: The house owner will not charge guests for electricity use of up to 10KWh per night. You are responsible for the cost if this limit is exceeded.